Hi folks, Doc here. 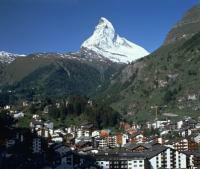 Switzerland, home of the Matterhorn, is famous for its fine chocolate and precision watches, among other things. 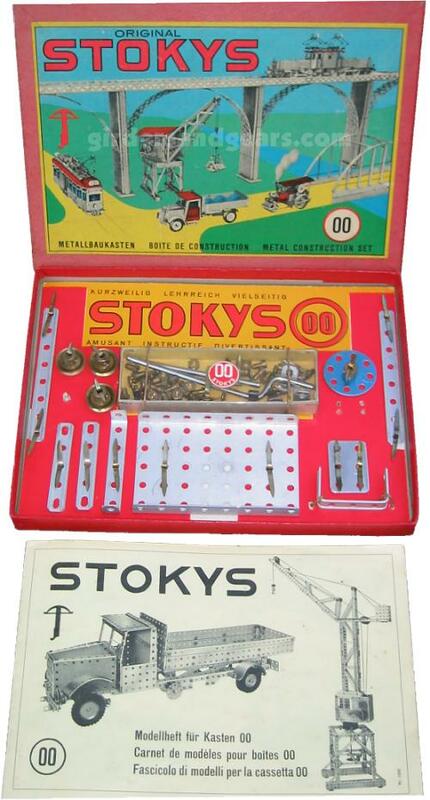 To metal construction system enthusiasts, one of those other things is Stokys. In 1942, on the advice of a prominent local toy dealer, they modified their original system, adopting the popular ½" hole spacing utilized by Meccano and Marlin Metall. Similarly, they used the British Standard Whitworth 5/32 thread in their nuts and bolts. 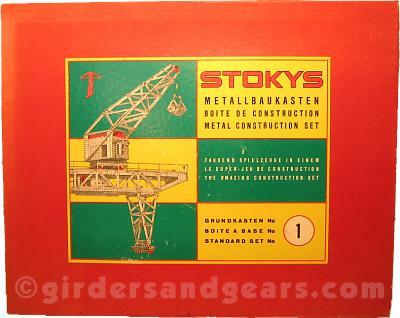 With these changes, Stokys Metallbaukasten ("Metal Construction Sets") was born. 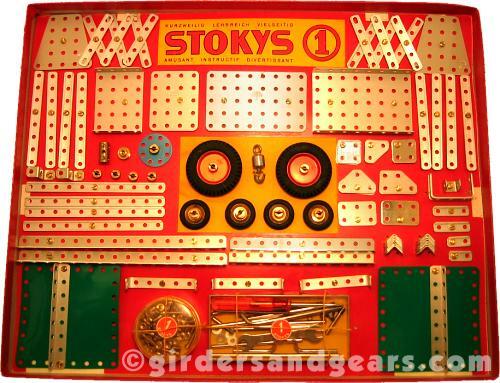 That first year, Stokys sets were numbered 1 through 4. The next fews years saw the addition of Set No. 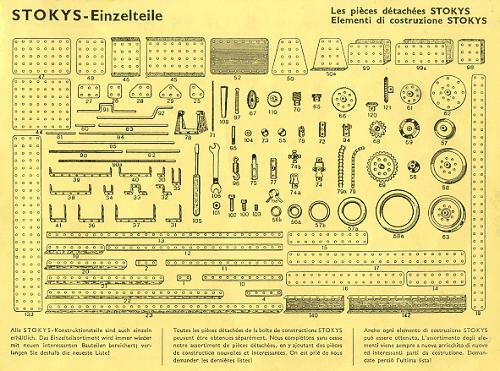 0, plus a number of accessory or add-on sets (designated 0a, 1a, etc.). 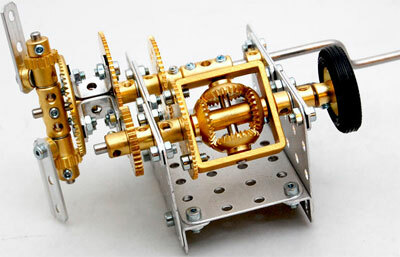 In 1946, they began producing electric motors for use with the sets. 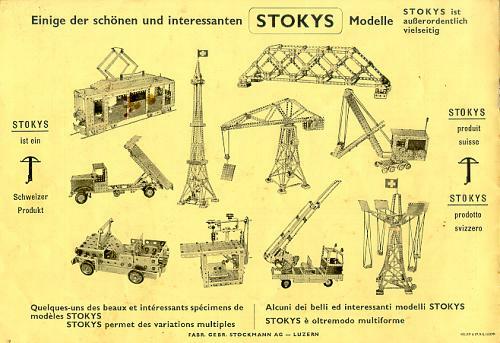 During this period, Max Stockmann, one of the company founders, obtained several patents related to various developments in the Stokys system. By 1982, the original Gebruder Stockmann company had become Stokys EIKO AG. In 1986, a new owner assumed control of the company, and the factory was moved to the City of Littau. 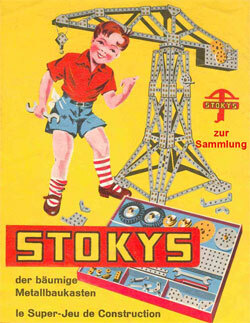 The company was renamed STOKYS AG. A feature of the Stokys construction system that sets it apart from most other systems is the material used to make the parts: aluminum. In addition, the perforated strips and double angle strips have an unusual cross-section: as shown in the photo below, these parts have raised edges on one side. The part inventory (see image below) includes a wide variety of plates, both flat and flanged, strips, angle girders, flat girders, and flanged flat girders, as well as sector plates, trunnions, and gussets. 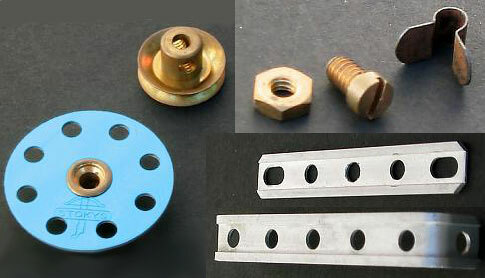 Wheels, pulleys, and gears are usually made of brass, many with double tapped bosses, while pierced disks are typically anodized aluminum (see photo). Screws and hex nuts are brass in older sets, but were replaced by black screws with metric M4 threads in 1988. 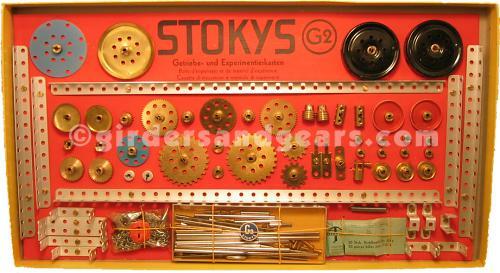 This is the smallest Stokys set from the 1960s, the No. 00. 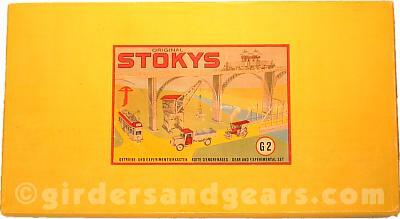 Here are two more Stokys sets from the 1960s.